So, what to do with all those broken crayons? 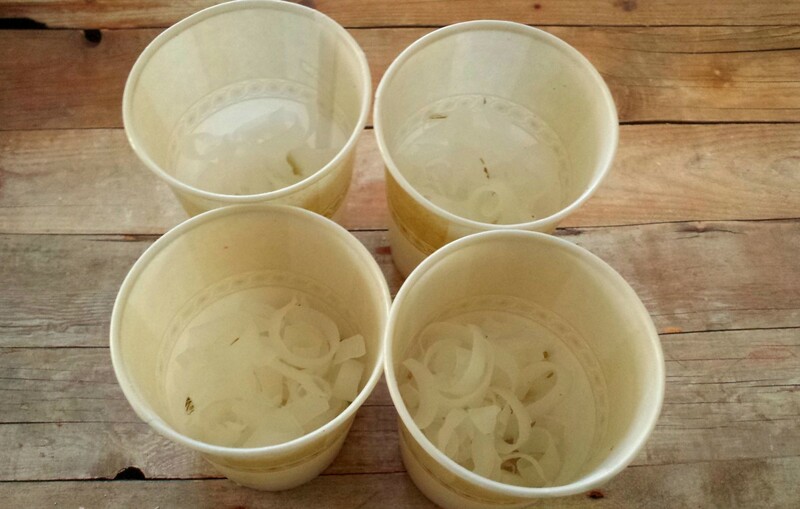 I despise throwing things away that I think can be reused somehow. 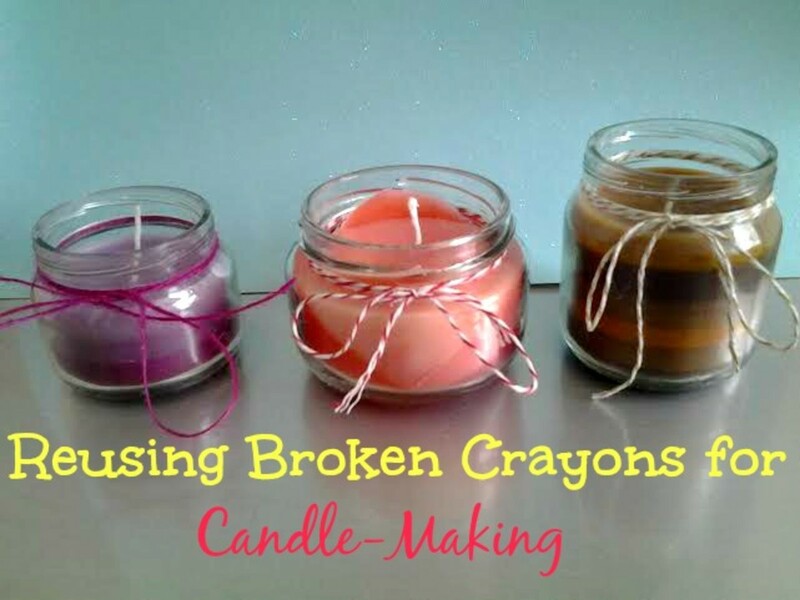 I found this post about creating Color Block Candles with broken crayons and had to try it out for myself. 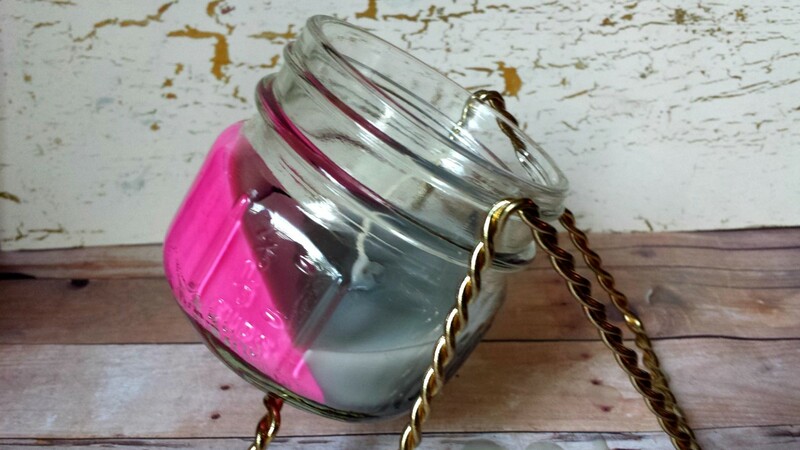 Even the jars I used to make the candles are reused from previous food or candle jars. I had a bridal shower coming up for a good friend and she is not registered for gifts. I wanted to make her some homemade gifts she can use to relax her during this stressful time of planning a wedding. I made a basket filled with homemade gifts and this candle was one of them. What to do with Broken Crayons? As a mother of two little ones, we have art supplies all over the house. Paints, paint brushes, an abundance of coloring books and crayons...everywhere! There are crayons and markers in the car at all times for those long trips and because my kids enjoy coloring and drawing often. Since they love to color and draw so much, crayons can be found in my purse, too! Due to so many crayons and rowdy, energetic children, it makes sense that we also have several broken crayons. Sometimes, they are left on the floor and Mommy does not see them and steps on a few, breaking them into pieces. Sometimes, the kids get too excited and color them broken! Start with picking out what colors you want the candle to be. 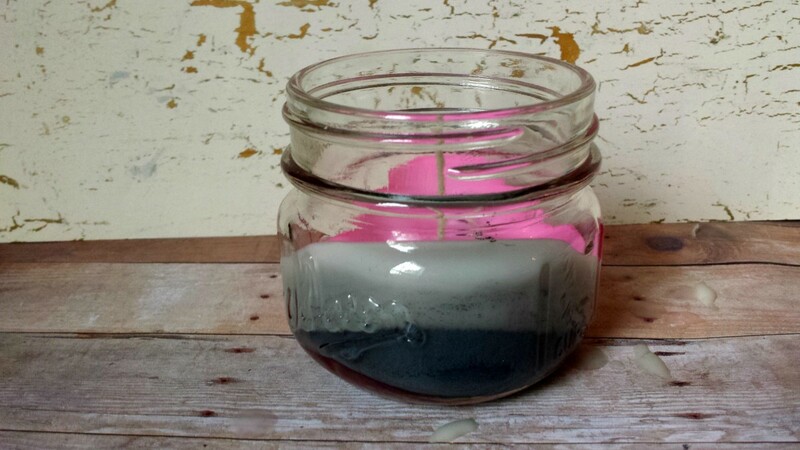 Decide how big the jar will be for your candle so you know how much wax and crayons you need. I would suggest having at least two different colors for your candle. 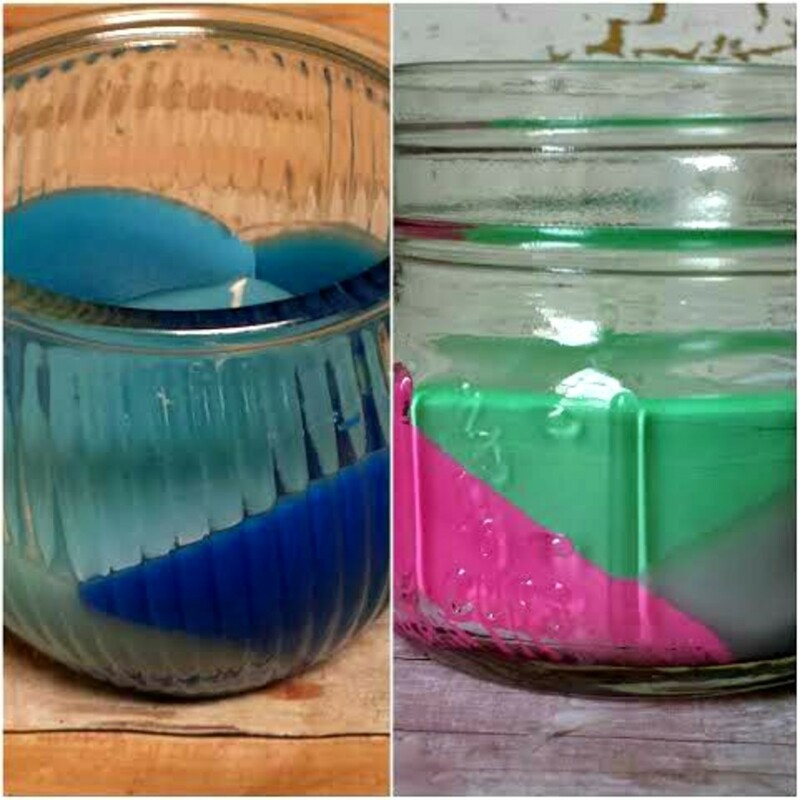 If it is a larger jar and you need to use more candle wax, you may need at least 3-4 crayons of each color for the colors to really show through after melting. You need candle wax, preferably candle wax flakes. I got creative and resourceful for some of these candles and used candlesticks for my wax flakes. I just peeled the candlesticks with a vegetable peeler. You need a wick which you can probably buy from a craft store. Amazon sells them, too. I provided the link to it in the ad below. I was able to use the wicks from the candlesticks I already had. 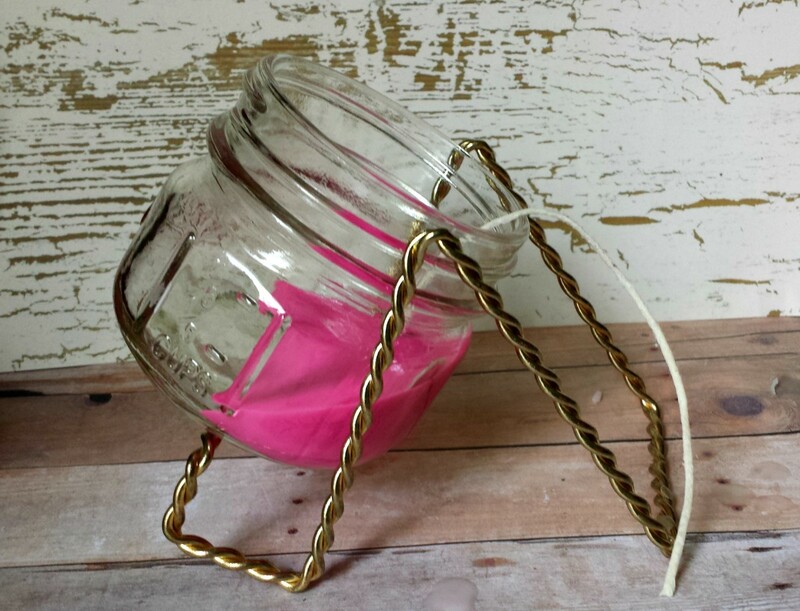 You need a plate stand to prop up your jar for tilting in order to create the angled design. 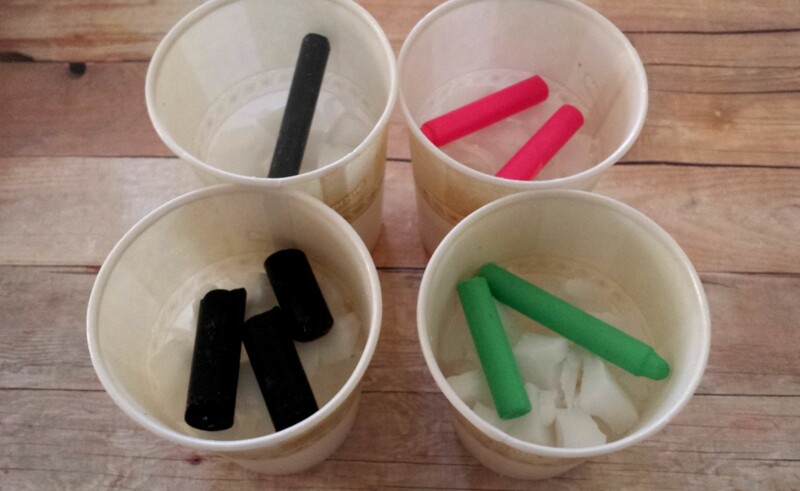 You also need a few popsicle sticks to stir the wax, one per each color. You need paper bathroom cups like Dixie cups, one for each color. Paper cups are best so they do not melt in the microwave. For more scent, add fragrance oils, optional. Fun and easy DIY projects I have made along with delicious recipes. 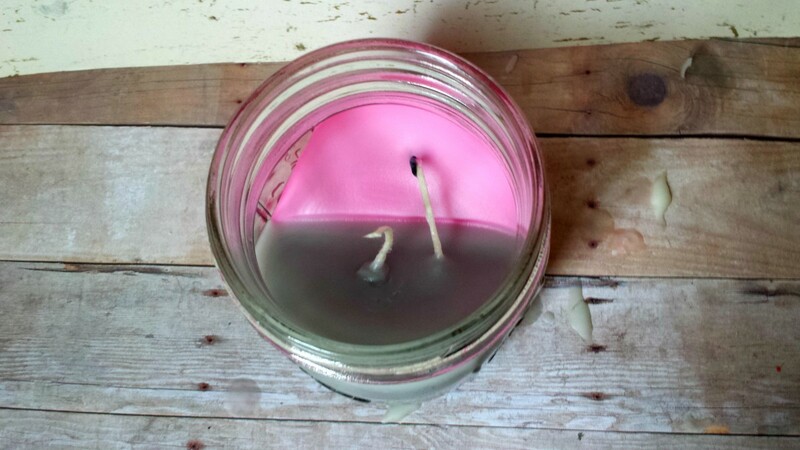 Have You Ever Made Your Own Candle? Peel off the paper from all the crayons. 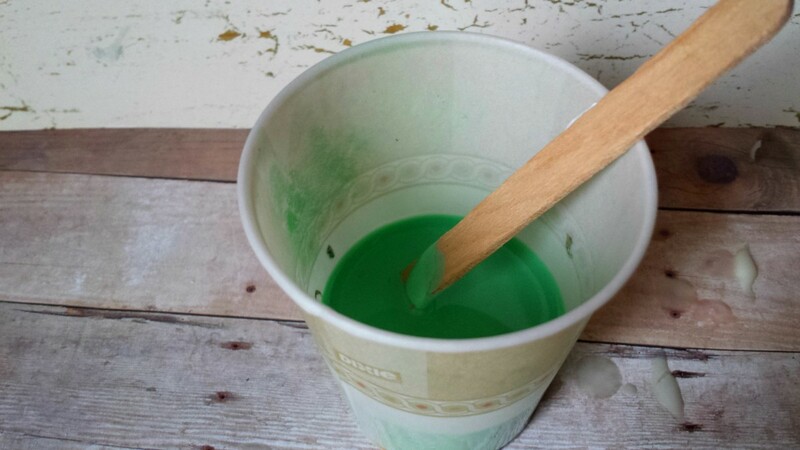 Pour wax flakes into paper cup and add crayons on top. Heat in microwave for two minutes, then stir with popsicle stick. Heat for another two minutes, if needed. I found that I did need to heat for the full four minutes. Place jar into plate stand. Put wick in while pouring first layer of wax. Make sure it is centered. 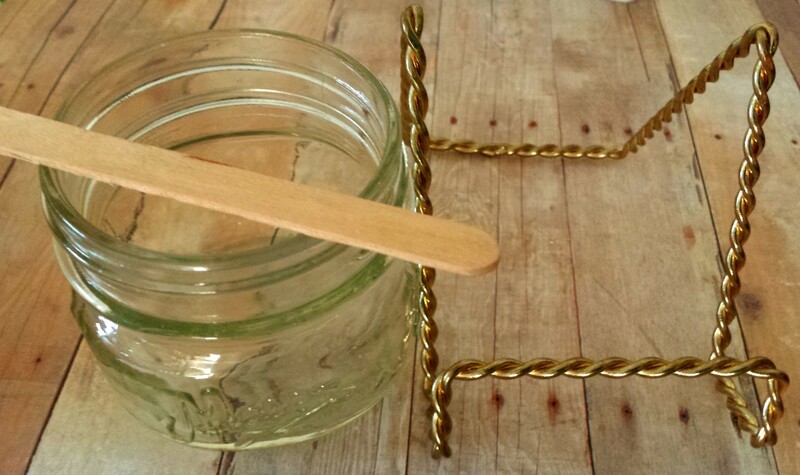 If you buy the actual wicks, then just place it in the jar before pouring wax. Let wax cool and harden all the way. Repeat and add next layer on the other side of jar. Repeat process until you are done. If using oils for scent, add in a few drops in the cup after the wax is melted. 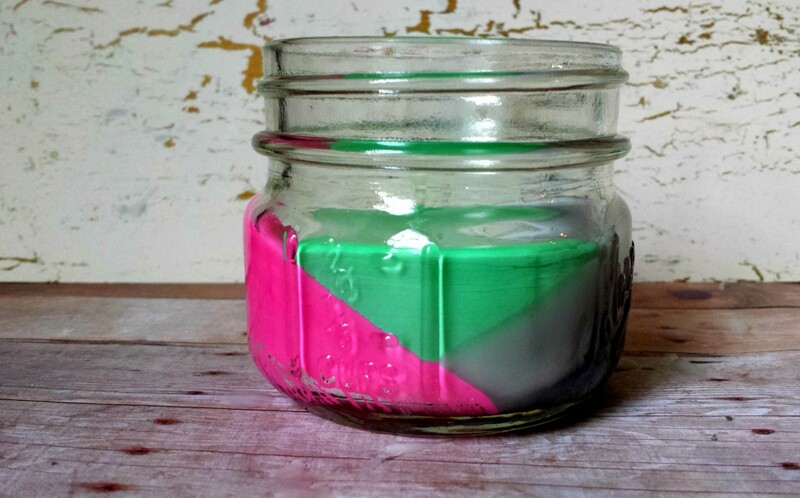 Follow all the steps to make the color block candles but do not place jar in plate stand. 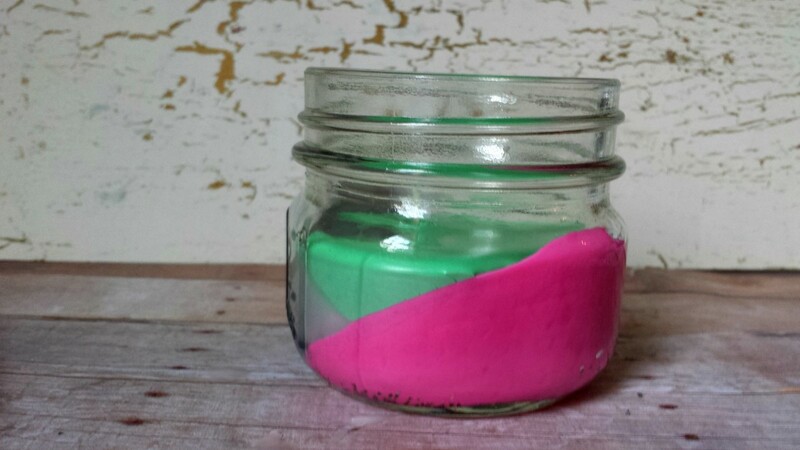 Place wick in jar first, then pour one layer of colored wax at a time and let cool before adding next color. Plan out what colors you want before beginning the process. You can do the ombre effect by using colors of the same color family. Place the different colored layers one on top of another without using the plate stand. Use the colors of the rainbow. Use Christmas colors for the holidays. Black and orange for Halloween. White and orange colors for Halloween to look like candy corn. Match the colors to a party or wedding theme. You can use a candlestick, (which is what I first used for this project). 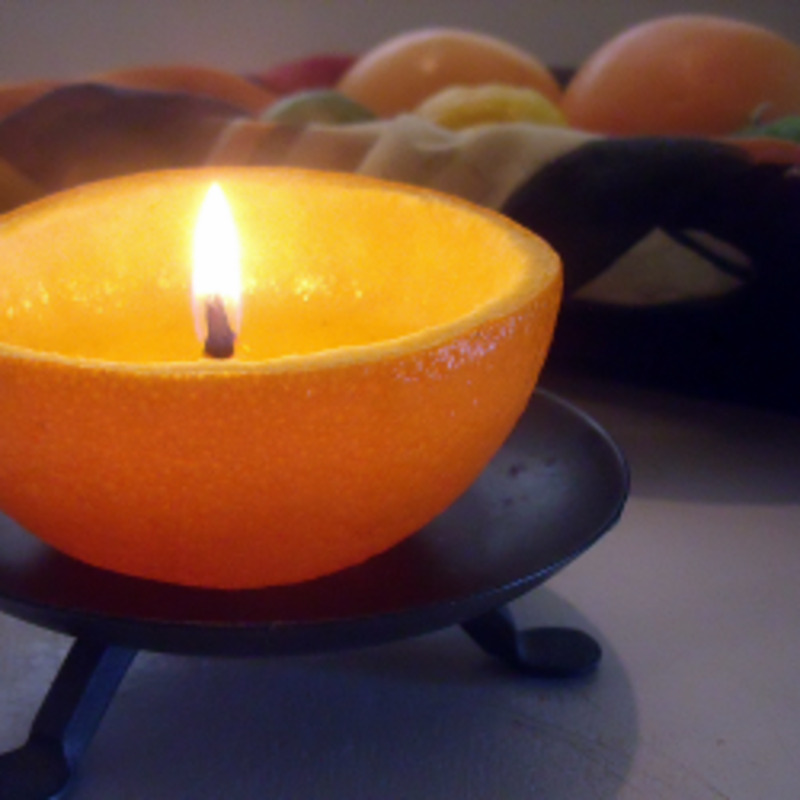 Use a carrot/vegetable peeler to shred the wax off the candlestick. 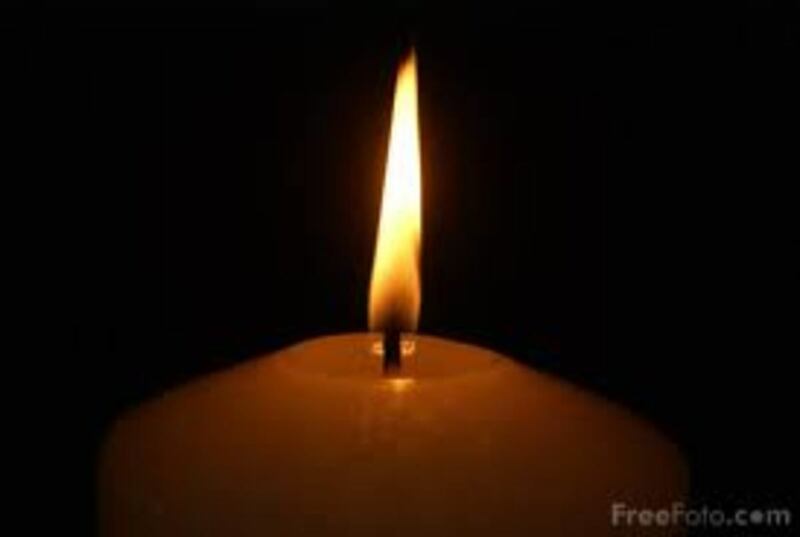 You can also use the wick from the candlestick. You can buy the wax flakes in a bag. It may be available at craft stores but Amazon has the soy wax flakes available. (I provided the link to it in the first Amazon ad). Add oils for extra fragrance to your candles since the scent of the crayons is present after wax melts and cools. You can find them at craft stores like Hobby Lobby. Do not add oil until after wax is melted. Add a tablespoon of Crisco shortening so the candle burns evenly. Reusing broken crayons goes a long way. If the kids are not going to use them once they are broken, there are many projects you can do with them. Making candles with them is one way that they will be useful. 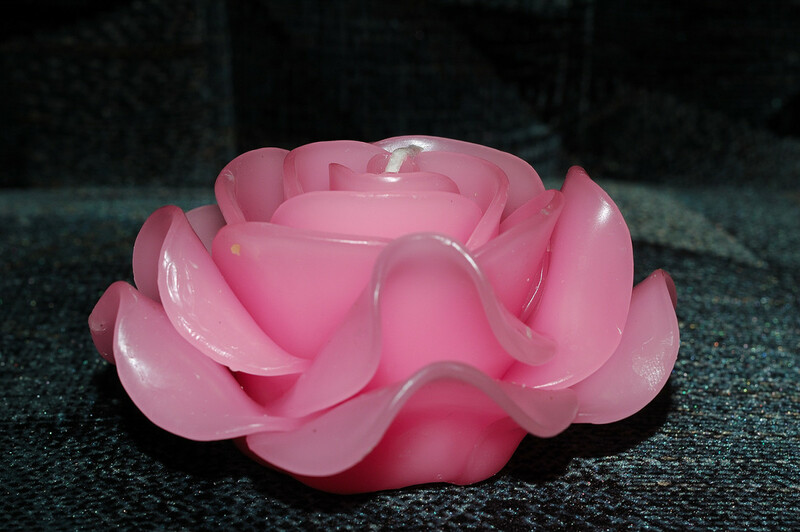 Candles make a wonderful gift especially when they have a nice fragrance. They are pretty to look at and you can make their appearance customized for the gift recipient. 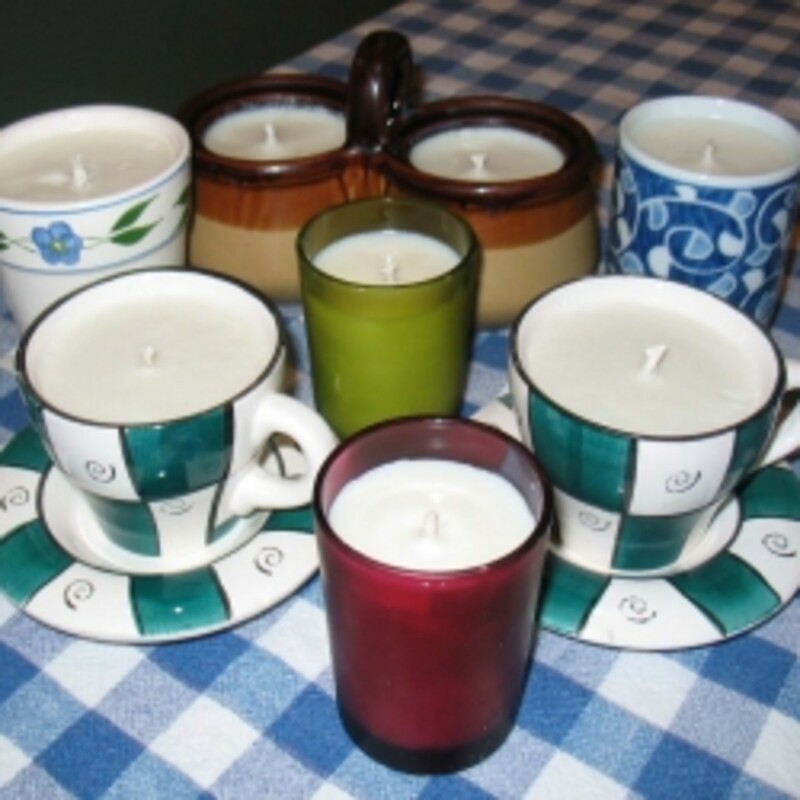 Candles are also relaxing so they make nice bridal shower gifts or anniversary gifts. Place them in a bathroom for a spa day for your significant other or for mom on Mother's Day. 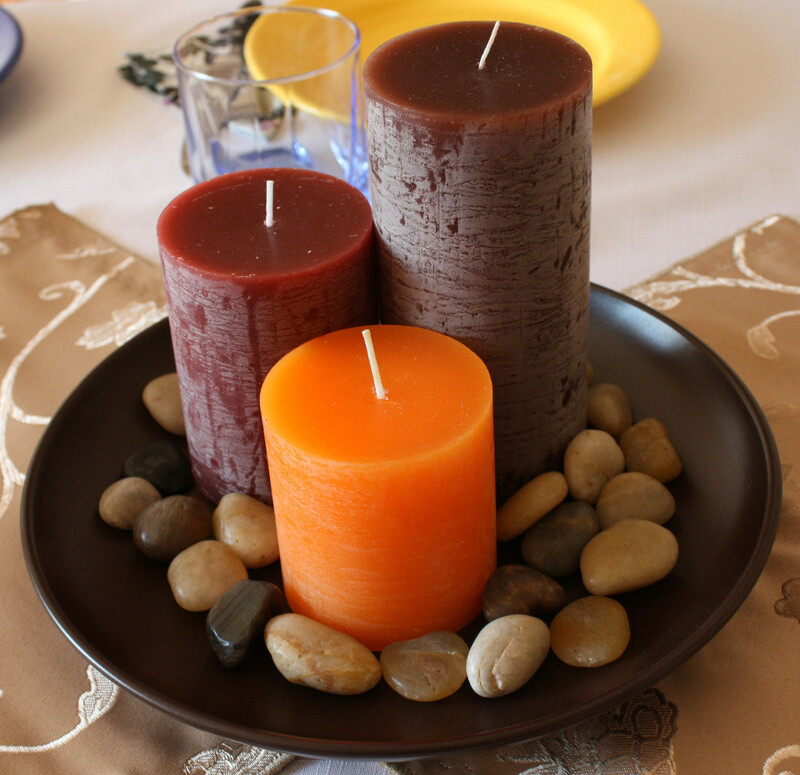 Candles offer a room a nice scent and add to the mood and ambience of a space. Kids can help with peeling the paper off crayons like my kids did. They can watch you pour the melted wax into the jar and show them how the wax hardens and cools. They will enjoy smelling the candle, too! 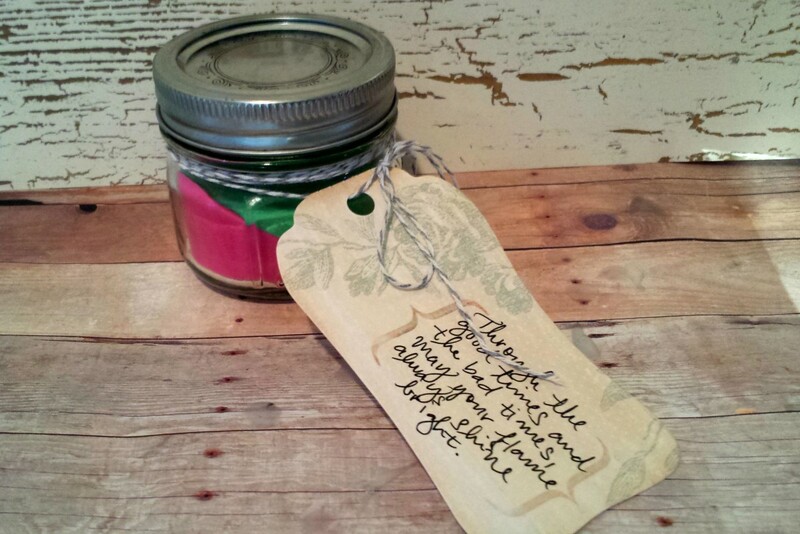 Let them write a note for a special someone to give the candle as a gift and they will be happy to know they helped make something special. Mother's Day and other special occasions are around the corner. Make those special people in your life a treasured gift from the heart with these upcycled gift ideas. Piñatas are a fun way to celebrate festivities and graduations are one of the milestones that should be celebrated to honor a student's hard work. Follow these steps to make a DIY graduation cap. Reusing glass bottles and jars helps save you money and helps the environment. 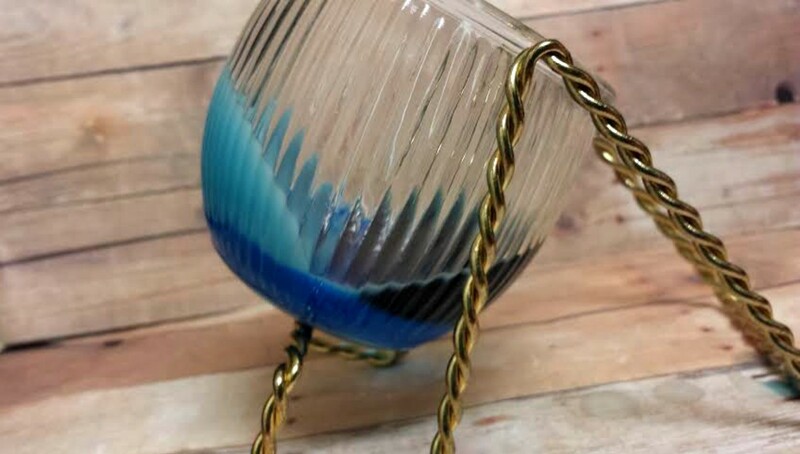 Read here for some crafty ideas to reuse glassware. Hi Peachpurple, sorry for responding so late. You can find the wax flakes from Amazon and I posted a link to it. You can find the wax melts at most retail stores like Wal-Mart, Target and craft stores. 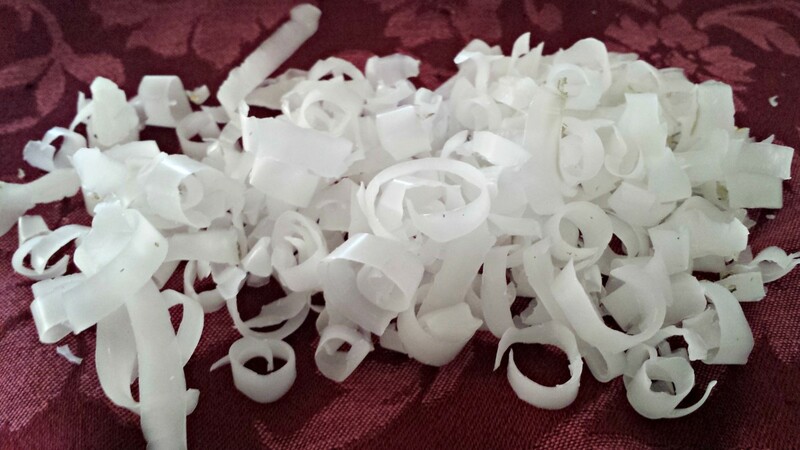 You may be able to find the wax flakes at craft/hobby stores, too. FullOfLoveSites, thanks so much, I hope you get to try out this project idea! where can i find the wax? bookshops? Well this is just awesome! My daughter has pretty much outgrown crayons, but we have a big box of them. She will love doing this craft on a rainy fall day. Pinned for future use and shared. Thank you, Hendrika it's something fun to do with kids and mine enjoy helping. It's a fun way to teach them to recycle. Thanks for sharing it with others and how exciting to have all those grandchildren! This is a most interesting article. I wish I had it when my kids were still small or even when I looked after my granddaughter. I find recycling crayons very exciting and know a few people I will tell about this article. Lots of grandchildren on the way! A simply awesome hub. Very informative and step-by-step. I will certainly try to make candles this way. Passing this on. Monis, thank you so much for the nice comment! This is awesome! You are such a creative and talented person! Thank you, Michelle, that's great that your grandmother used to do this. It's nice how things that past generations used to do come back full circle and we can appreciate the same things, too. How awesomely creative. My grandmother used to do this. Hi Kathleen, thank you for reading and I appreciate the vote up and pinning. 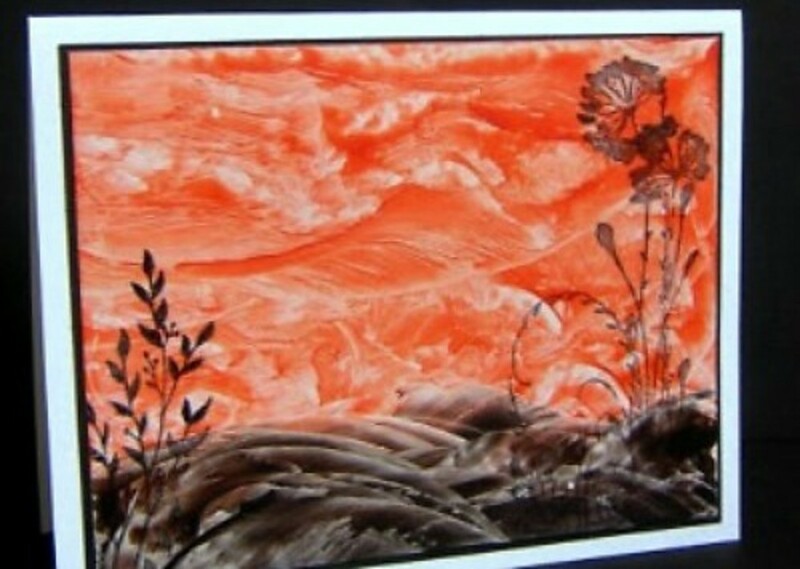 Wax art sounds really interesting! Liz, yes, I think this is a less inexpensive way to go and something useful to do with crayons the kids aren't using. Mine like to say the broken ones don't work anymore, LOL. Now, they can help make candles instead! Jacqui, this will come in handy then for those broken crayons! My kids loved helping with these candles...it was nice to not have to deal with unwrapping the paper off of the crayons, too - I left that up to them and they enjoyed seeing how the crayons melted with the wax. 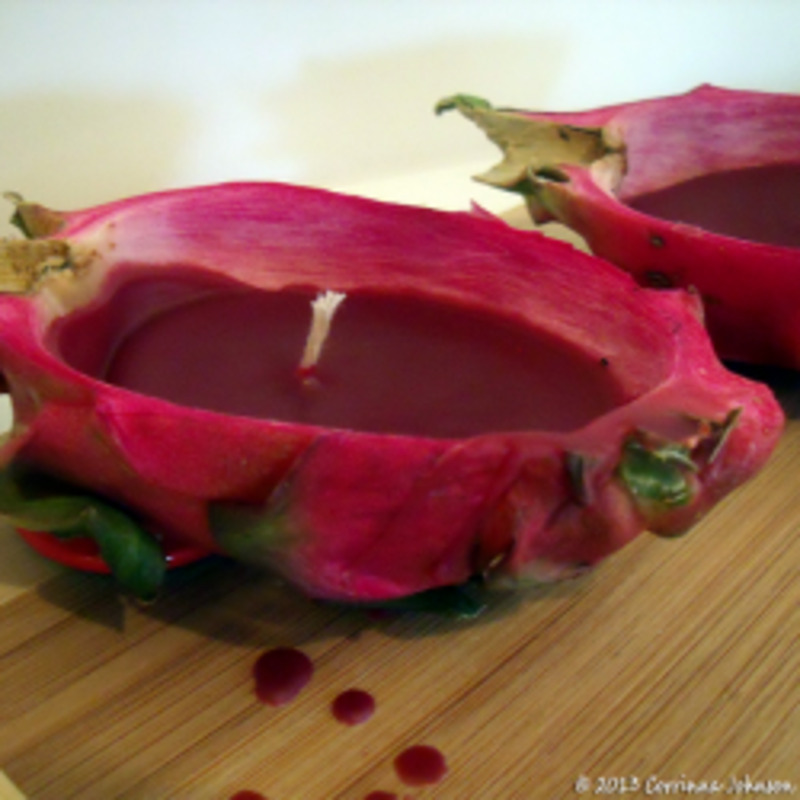 Great idea, especially because candle wax colouring is so expensive! Wow! I shall have to put this aside in a wee folder for when my daughter is old enough to help out...(is only 12wks, so could be some time! )...and crayons are getting broken! Thanks for sharing this hub...awesome idea! 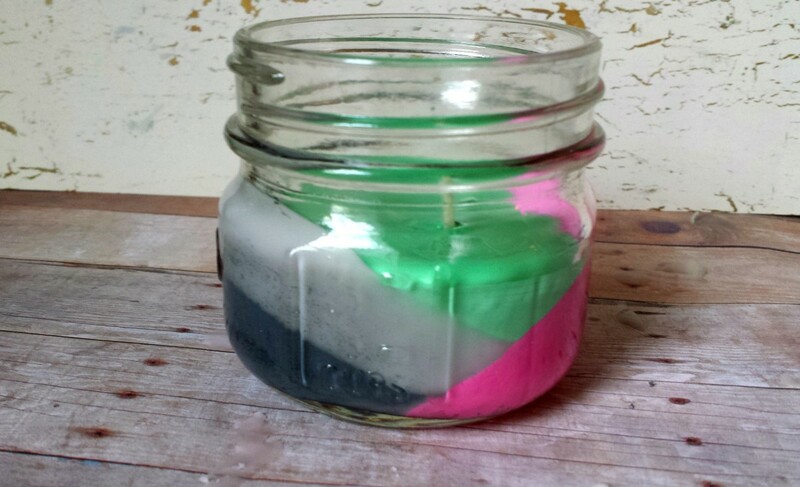 I tried making candles with crayons a few years back and the smell was awful but I saw in your tips that you can add scent. Maybe I just didn't use enough or none at all. I don't remember. Anyway, I always thought using broken crayons is a great way to recycle. Well done on the tips and pictures! Voted up. Great hub. I'm going to make some candles out of crayons. Of course I will have to buy some. Oh that's a smart idea, thank you, I'll try that! Great hub! 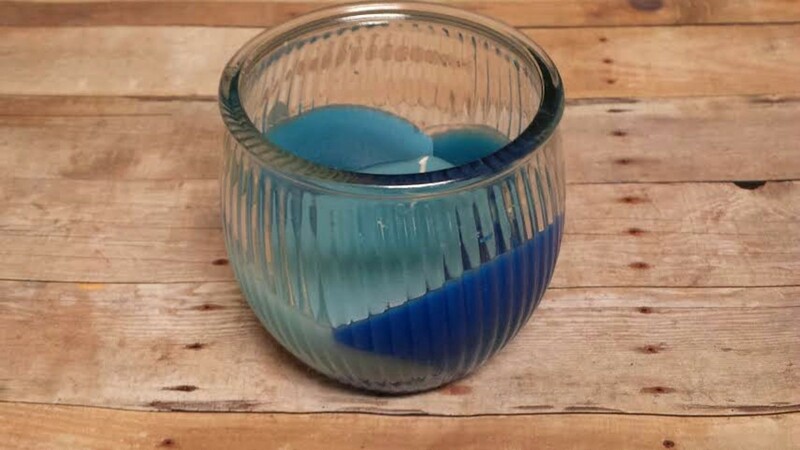 I do a similar craft with empty glass baby food jars, and the wax left at the bottom of used candles. 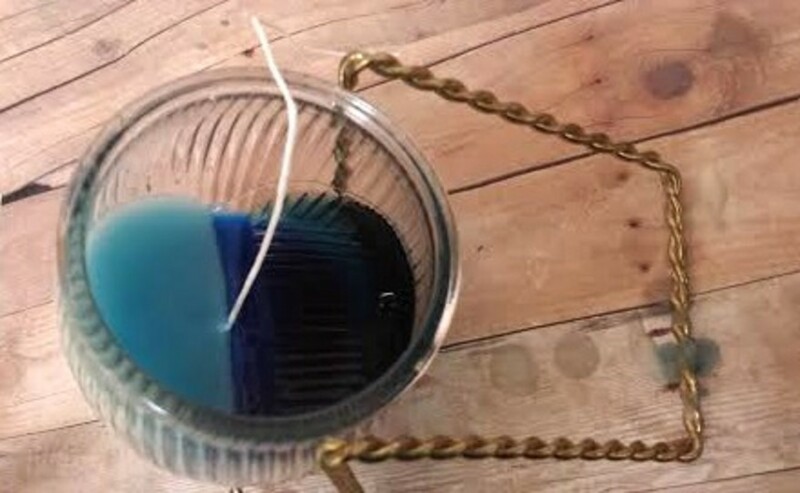 Just pour boiling water into the old candle container and let it cool completely before taking out the wax to reheat and put into the the new candles. Hi Bill, thank you - I feel like we can stretch our creativity more when we're frugal so it's a win-win! I love articles like this one. We are into frugal big time here, so this article will fit in quite nicely with our lifestyle. Thank you!